Previously known as the Church of England, the St George’s Cathedral is an Anglican church built in the 18th century. 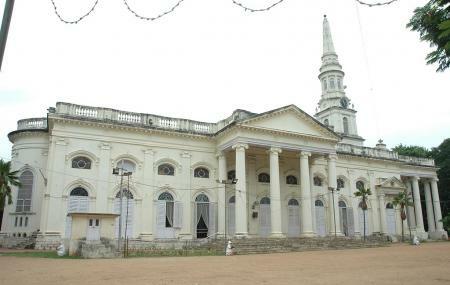 The Church of South India was inaugurated here in 1947, and thus this Chennai attraction holds crucial importance in the history of the city. The Church of India is one of the most important churches in India given the fact that it ranks second in the list the most populated (number of members) church in India. The church dates back to two centuries, adding to the vintage appeal of itself. There are Holy Eucharist from Monday to Saturday at 7:30am. Every month on the first, third and fifth Sundays are dedicated to Choral Eucharist and Sermon is held at 7:30am. The Evensong and sermon commences at 6:00pm. How popular is St George's Cathedral? People normally club together Arulmigu Sri Muppathamman Temple and Click Art Museum while planning their visit to St George's Cathedral. Another architectural marvel in Chennai . Must visit. The marbel statues inside the church are breathtaking. The cemetery has some ancient British graves and tombs. Please maintain the sanctity if visiting the cemetery. The Cathedral is over 200 years old but with one coat of paint it will look like it was built only yesterday because it is well maintained - the lawns aren't maintained as much though. I can't say that the Cathedral is beautiful but There's so much character in the Cathedral. It looks so grand. There are plaques to commemorate people who have passed away -on the walls right from the entrance till the end of the prayer hall. It is quite interesting to read them all - each plaque offers a glimpse into the life of that person being remembered. You will also find plaques commemorating British Officers who were murdered during the Freedom Struggle by Rebel Freedom Fighters. You can say that the walls are almost like a mini museum. The vintage furniture too looks like it has been there for very long but it is solid - I never found them creaking. You could get lost just by looking at it and being in it. It calms your nerves.